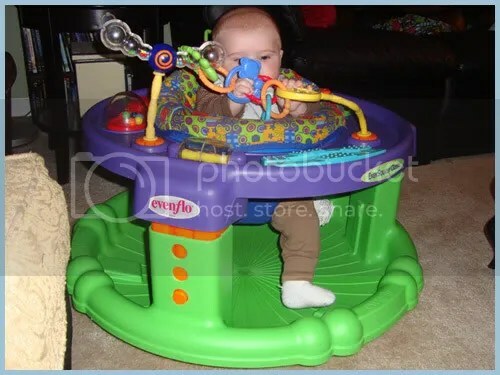 I looked on craigslist this weekend for an exersaucer for The Munchkin, just like his pediatrician suggested and I found one for $25! I meant to pick it up yesterday after work, but I forgot to go to the bank and didn’t have any cash, d’oh! I was happily surprised with what good condition it was in, and started washing it immediately when we got home. The Munchkin watched me work as he bounced in the Johnny Jump-Up. It came with some mini rings on it, but those had teeth marks in them (gross) so I replaced them with new rings that I already had. The Review: So far, so good! 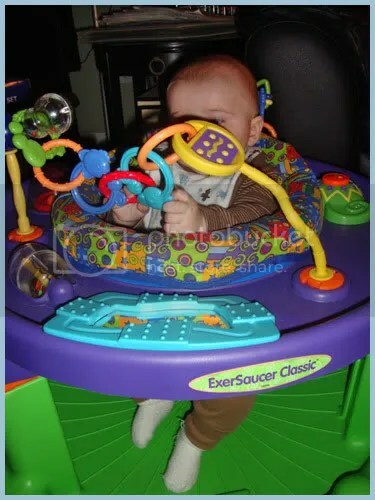 The exersaucer looks great now that it is all cleaned up, and The Munchkin loves playing in it. He immediately fixated on the yellow and purple thing and tried to bring it to his mouth, which was pretty cute. I love how there are three different levels that I can adjust it to, so this will grow as The Munchkin grows. Right now he’s on the lowest setting so his feet can touch the bottom. The bottom of the whole thing is curved, which I wasn’t sure about at first, but it ended up being kind of neat because it was almost like a rocking chair. There are feet that you can pull out on the bottom though, if you don’t want it to rock. The Munchkin can’t make himself now, but the seat itself is able to spin around so the kid can access all of the different toys. I have him facing the mirror, rattle, and yellow/purple thing and he seams content with that. He hasn’t discovered the spinning ball thing in that area though. I don’t think he can look at himself in the mirror yet either; still too short. End Rating: 5 out of 5 hearts! Maybe it is because this is the only exersaucer we’ve tried out, but I don’t see how this thing could get better…unless it played music maybe. But not everything needs to play music.